I’ve had this book (and the second in the trilogy) on my Kindle for a while and I decided to give it a try. I did find the idea of this book to be quite a unique one. I was able to empathise with Ismae a lot. I wanted to protect her at the start of the book… but as the plot went on, I liked the fact that she was able to protect herself and that she grew into a strong character. I thought that the setting of the book worked really well. It was interesting to see Syballa and Annith from Ismae’s perspective, but I would have liked to see more of her relationships with the other nuns in the convent. I did find it fairly interesting that the old Celtic gods were absorbed into the Christian faith and the explanation given for them. It was also pretty cool to see the observations about death not being evil… just inevitable. Too many books make the god of death into the villain and it was nice to see this storyline take a different turn. I thought it was pretty cool to see the different ways Ismae had to commit her job of killing, such as the different types of poison. And the bracelets that could be used as garrotes. I did like the romance in this book, even though it was a bit frustrating at times, since I felt the romantic aspects were being tip-toed around for too much of the book… but it did eventually reach a satisfactory conclusion. I liked reading about Ismae’s interactions with the other characters, particularly Anne and Isabeau. 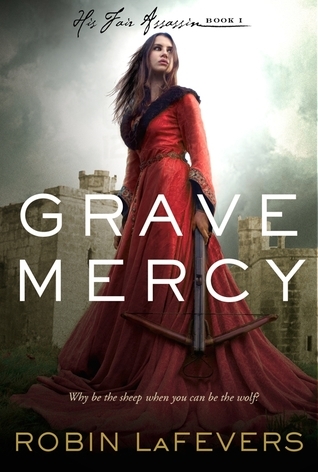 I did also like seeing some of the intrigues that were going on… and how Anne and Gavriel had to work their way around the people who were trying to control the duchy. I liked meeting Beast, too. He was a really cool character and I enjoyed seeing his friendship with Gavriel and the third member of their group. I was pulled really easily into this book and I really liked the atmosphere in it, as well as the paranormal aspects to it. I felt it was as much about the characters as the plot and I’m hoping to see more of Ismae and Gavriel in the next two books.